Posted in Fashion, Second Hand Shopping. 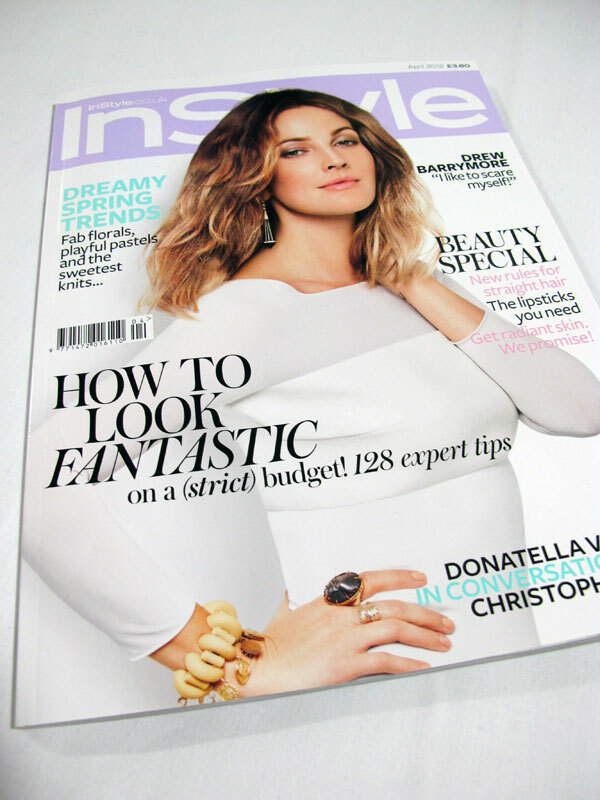 Back in January, I was invited to take part in a photo shoot for InStyle Magazine. At first I wondered if they’d mixed me up with some supermodel of the same name, but when I heard the words ‘charity shopping’ I knew they were on to something. My love for second hand shopping is well-documented, so I was delighted to be asked to share my tips with InStyle’s readers. The shoot was done in collaboration with Oxfam (I write regularly for their fashion blog) and the lovely Oxfam ladies brought along some donated goodies for me to wear. 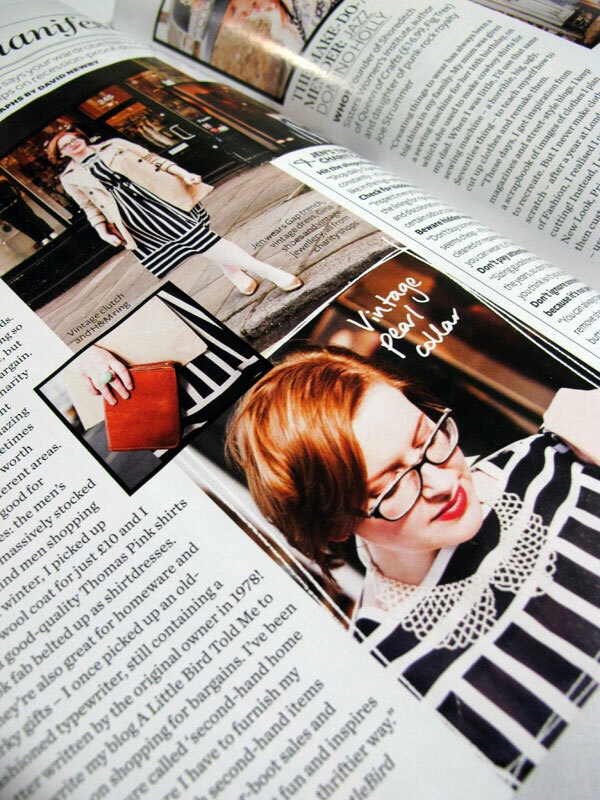 The striped dress features in their current press campaign which you might’ve spotted in Company Magazine and Grazia – it’s hard to believe someone would give it away! The rest of the pieces are my own charity shop finds, including the slightly-too-small Gina shoes and a gorgeous Gap trench coat I picked up a few days beforehand. 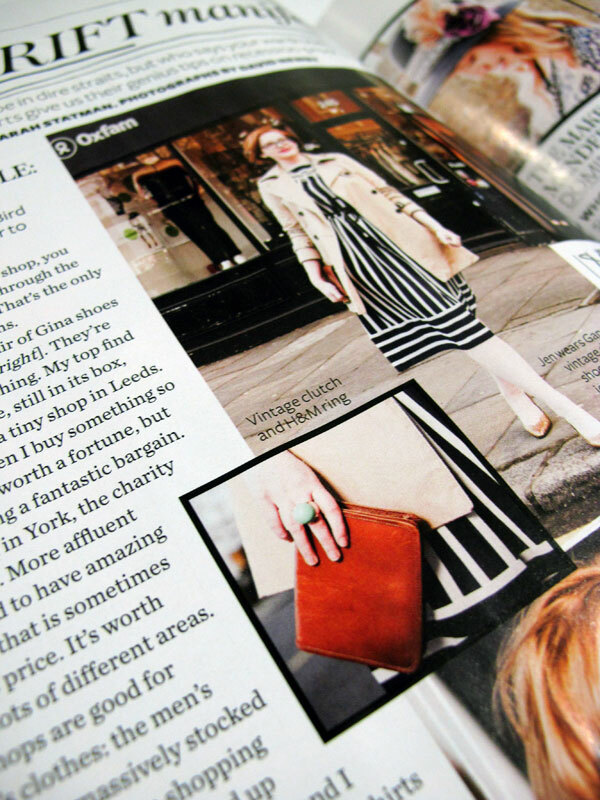 Yes, as soon as I found out I’d be wearing head-to-toe second hand in an issue of InStyle, I hit the charity shops… hard! Yikes! Apart from that full-length shot, I’m pretty pleased with how the feature turned out. Apart from me and my charity shopping, there are girls representing crafting, market shopping and eBaying in the feature – there are some great tips for budget shopping. You look amazing silly!! Such an amazing outfit too! Well done on the feature Jen! I look forward to reading it! This is such an amazing achievement! Clearly the headline on the front cover is all about you! How t look fantastic? Yup, you have that covered! Congrats on the piece – you look amazing, and always inspire me to go rummaging in charity shops! Oh my gosh, this is so fantastic!! I can’t believe you are wearing all second hand stuff! And what are you on about, you look AMAZING and you are in InStyle! I’ll have to go buy a copy now! Well done for getting a spread and I love your outfit in it, particularly the clutch and collar! the pics look amazing!! well done!! This is my favourite magazine and the fact that you’re in it this months is amazing! Wow! wow congrats on making it in a feature article in a great magazine! Your blog is great and I love the re-using inspiration you endorse! I am a self proclaimed “eco-warrior” so I totally support your ideas! What a great feature, congratulations! Shame I can’t buy it over here but I was able to read your piece from the images! wow that’s amazing! congratulations jen! Check you out, lady! You look awesome (yes, even in the full length shot, why on earth don’t you like it?) and what a cool thing. Well deserved. I really must learn from your charity shopping, I am terrible at it! Far too impatient! Very well done on your feature! 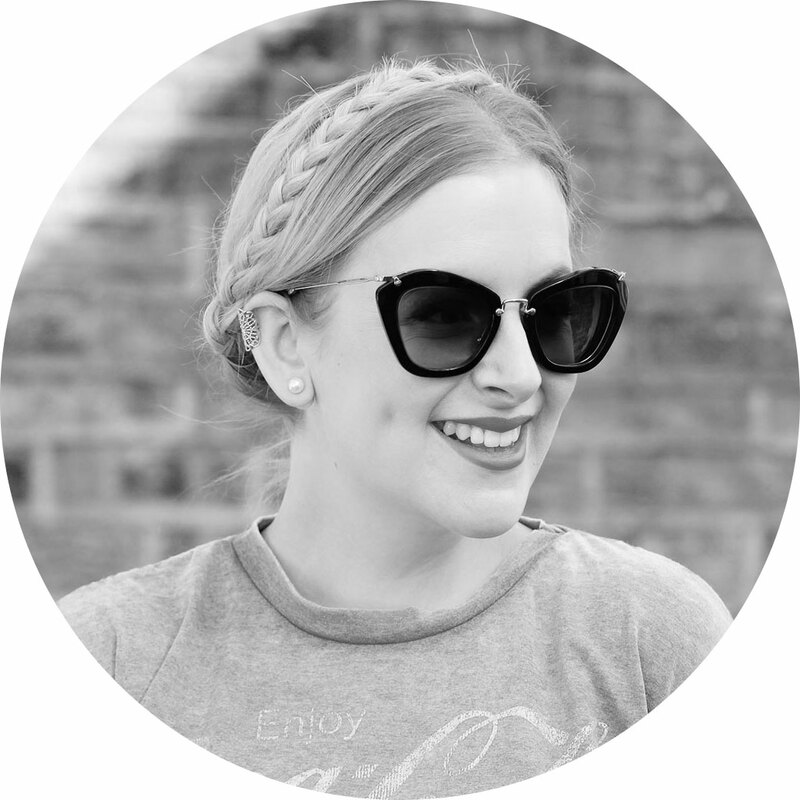 Thanks for your lovely tweet – so glad you love the blog! Just spent a happy half an hour reading yours and it’s a lovely place you have here! Congratulation. 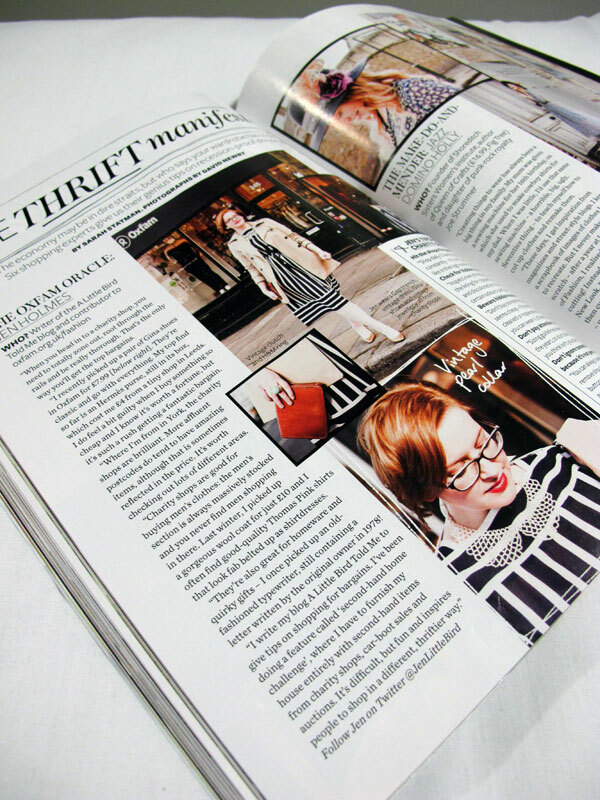 Its nice to see a different face in magazines instead of the same bloggers. I will be getting this issue!